the energy required to convert reactants to transition-state species or an activated complex that will spontaneously proceed to products. The energy in joules needed to convert a mole of a substance from a ground state to a transition state, which allows a chemical reaction to occur. Minimum amount of energy to convert a stable molecule to a reactive molecule. The energy needed to form chemical bonds during a chemical reaction or to break existing ones. Fig. 10 Activation energy . 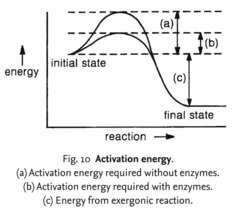 (a) Activation energy required without enzymes. (b) Activation energy required with enzymes. (c) Energy from exergonic reaction. the energy required to initiate a reaction. Chemical bonds holding molecules together are difficult to break, requiring extra ‘activation’ energy to push the bonded atoms apart. This extra energy makes the bonds less stable so that the molecule releases not only the activation energy but also the energy unlocked when the chemical bonds break, forming an EXERGONIC REACTION. Activation energy can be applied externally as heat, but this is inappropriate for living organisms. Instead, they rely on biological catalysts (ENZYMES) which decrease the activation energy needed for the reaction to take place. See Fig. 10 . See also ENDERGONIC REACTION. a method of analyzing the content of elements in samples of biological material. The sample is bombarded with nuclear particles and the elements in it measured by the radiation emitted by their radioactive daughter products. Called also radioactivation analysis. the difference in energy between the ground state of the reactants in a reaction and the point of maximum energy or transition state of the reactions. Usually lowered by enzyme catalysts. the combination of complement (C4, C2 and C3) that binds to the antigen-antibody complex in the initial reaction step in the classical pathway of complement activation. See also complement. According to Augis & Bennett method, the activation energy can be determined by the Eq. Similarly, the activation energy of teff grain was found by Sadik et al. Analysis Of Volatile Species Kinetics During Typical Medical Waste Materials Pyrolysis Using A Distributed Activation Energy Model", Journal Of Hazardous Materials, 162(2): 646-651.
where a is the extent of conversion; A is the Arrhenius pre-exponential factor, 1/s; E is the activation energy, J/mol; k is the rate constant, 1/s; l is the number of parallel reactions; n is the exponent of oxygen partial pressure; [p.
Moreover, the activation energy of diffusion decreases from 192. Evaluation of activation energy of thermally stimulated solid-state reactions under arbitrary variation of temperature. In the case of the lithium reagent, this is due to lower activation energy for the second substitution. This behavior of 2-ME is supported by the higher values of activation energy and excess activation energy of 2-ME as compared to 2-EE. Here we have a good estimation for polaron hopping activation energy in [Li. a] is the activation energy for the moisture diffusion (kJ/mol), R is the ideal gas constant (8. The values for activation energy and activation volume were estimated at each pressure and at each temperature, respectively. Activation energy is defined as the minimum energy necessary to initiate a chemical reaction.